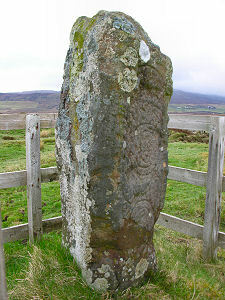 Clach Ard is a Pictish symbol stone on the Isle of Skye and as such is a real rarity. To date, 242 Pictish symbol stones have been found in Scotland. The majority of these have turned up on the eastern side of the country in an area from Fife in the south to Orkney in the north. Very few have been found in the west of the country: one in Argyll and Bute, two in Wester Ross, two in the Western Isles, one on Raasay and three on Skye. Clach Ard can be found at Tote, a crofting township near the head of Loch Snizort Beag a little over five miles north west of Portree. 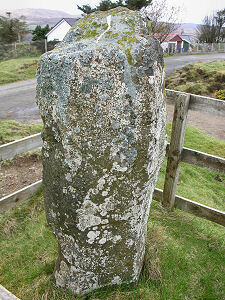 You reach the stone by turning north onto the single track B8036 from the A850 near Skeabost. 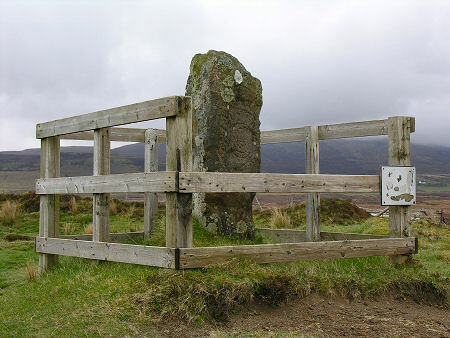 After a quarter of a mile you turn left onto the minor road to Tote, and a few hundred yards later you find Clach Ard, which in Gaelic means "tall stone", standing in a small wooden enclosure on the north side of the road. It has stood here since about 1880 when it was found being used as a doorjam during the demolition of a nearby cottage. Clach Ard is just under 1.4m in height and 0.5m wide. 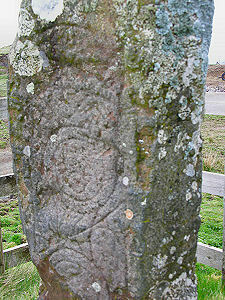 The front of the stone faces south west and carries the carvings. Some of these are difficult to make out because of erosion and coverage by lichen, but what you find are a selection of symbols often found on Pictish stones. These include a "double disc and Z-rod" across the width of the middle part of the stone with a "crescent and V-rod" above it. It is also said that there is a "mirror and comb" symbol near the foot of the stone, but this seems to have either sunk into the landscape or been obscured by lichen. 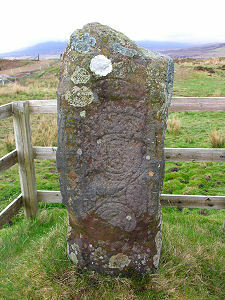 "The Picts" is a handy description for the confederation of tribes that came together to oppose the Romans, who then occupied the central and eastern parts of Scotland north of the Forth-Clyde line for several hundred years after the Romans' departure, until subsumed into the Kingdom of the Scots by Kenneth I in the mid 800s. Pictish Symbol Stones open a small window into an era of Scottish history which, though ending at a time when written records were appearing elsewhere on these islands, is little understood. Even less understood is what the symbols found on Pictish stones were meant to represent, though some have suggested they are symbols of powerful dynasties: which would make them a little like a Royal Coat of Arms in more recent history. 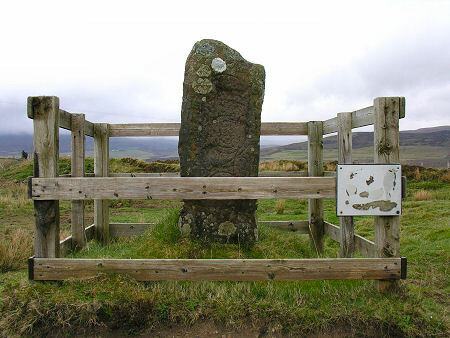 The final mystery, of course, is why a large, heavy, and far from portable stone carved by a people who dominated the eastern half of Scotland should turn up near the northern end of the Isle of Skye.